Behold: A low-budget vampire version of the Gossip Girl cast! Holy moly. Are they serious? What am I saying? 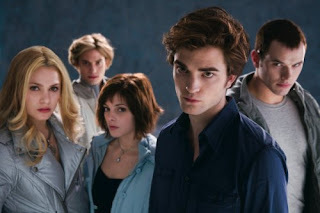 This is the movie adaptation of Stephenie Meyer's Twilight: of course they're serious! And just because I find those poses hilarious, it doesn't mean the rest of the YA-reading-world won't find 'em 100% awesome. After all, nothing says "brooding Gothic hero" like a scowl and a set of beautifully waxed man-brows, right? That guy in the back looks like Austin Scarlett from Project Runway. Who's he supposed to be?